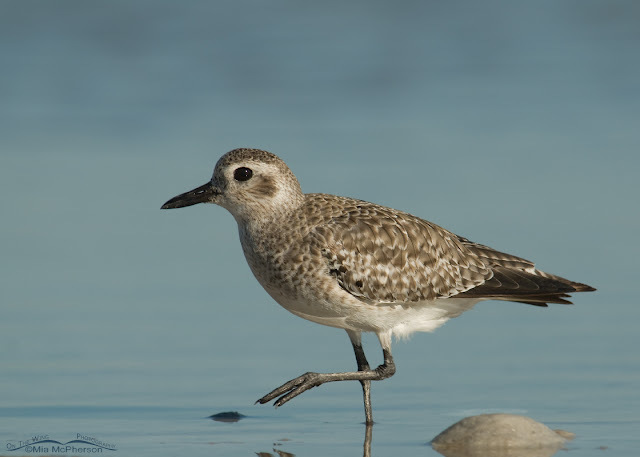 Since the shorebirds that breed to the north have started migrating back to the south I thought I would post some images of shorebirds that look quite different in breeding and nonbreeding plumage. This is a Dunlin (Calidris alpina) in nonbreeding plumage, the image was taken at Fort De Soto's north beach in Florida during the month of December a few years ago. During the winter Dunlins have dull gray-brown backs and heads with light-colored streaked breasts. 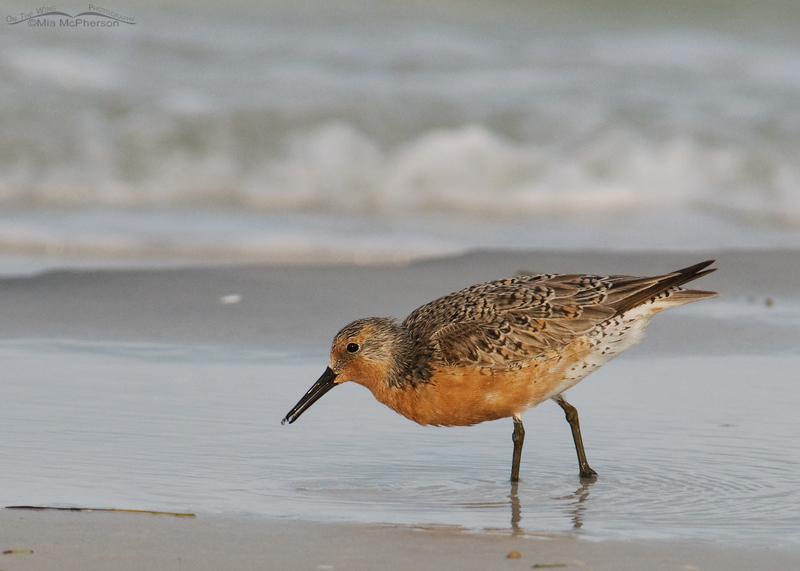 These hardy shorebirds winter along coastlines from southern Alaska south to Florida and Mexico. This image shows a Dunlin in breeding plumage also taken at Fort De Soto's north beach in May a few years ago about the time this shorebird would start its migration to Arctic and sub-Arctic areas of Alaska where it breeds on the tundra near ponds. 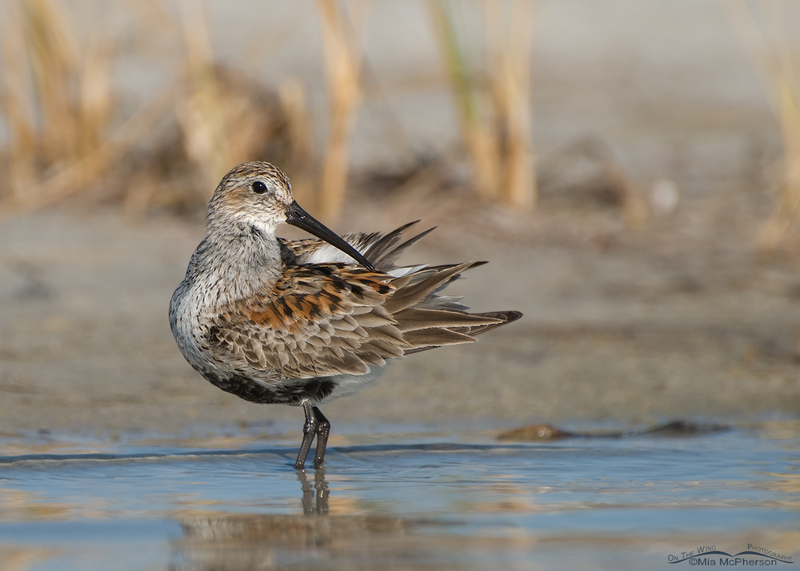 Dunlins exhibit a vast difference between nonbreeding and breeding plumage, so different that a novice birder might mistakenly believe that they were two different species. 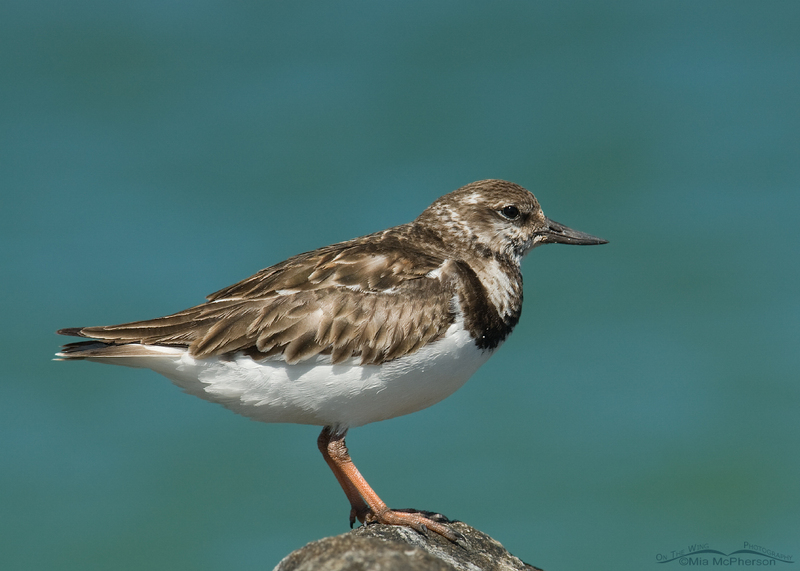 This is an image of a Ruddy Turnstone (Arenaria interpres) in nonbreeding plumage that was taken at Fort De Soto's north beach in Florida during the month of March a few years ago. The edges of the scapulars and coverts show wear, the face and back are brownish. 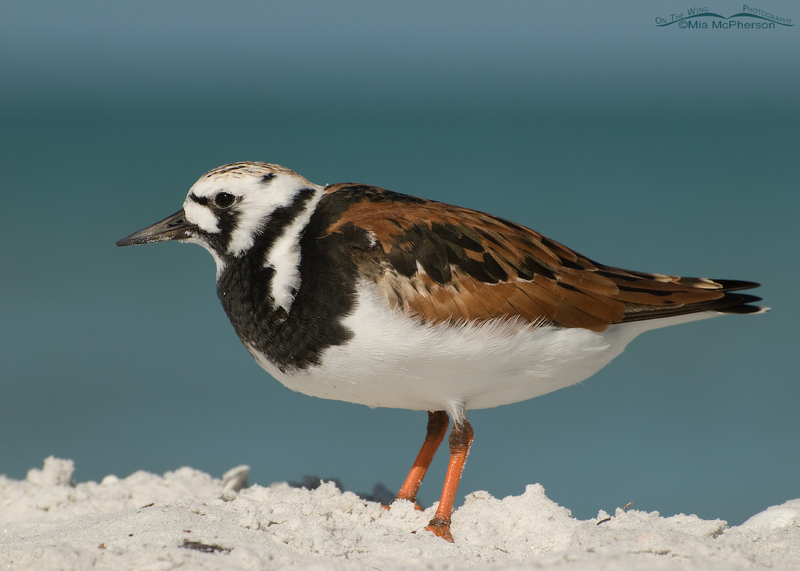 The image above shows a male Ruddy Turnstone in breeding plumage, this photo was also taken at Fort De Soto's north beach in the month of May a few years ago. Breeding males are brighter and more colorful than breeding females. The males are striking with their black, white and ruddy calico pattern. During migration some Ruddy Turnstones do stop over in Utah but I haven't been able to approach them close enough to get quality images. 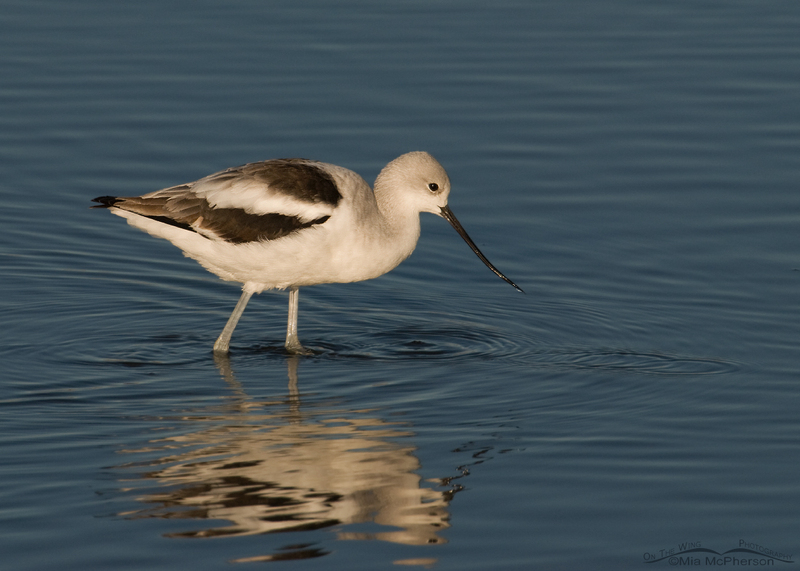 I photographed this American Avocet (Recurvirostra americana) in nonbreeding plumage as it foraged in Glover's Pond at Farmington Bay Wildlife Management Area in northern Utah a few years ago in the month of November. 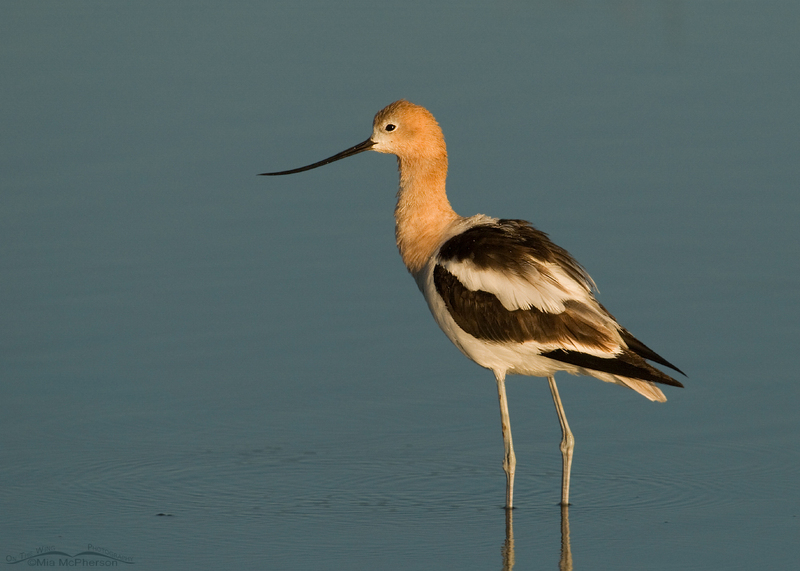 This image of an American Avocet was taken in August of last year at Red Rock Lakes National Wildlife Refuge in southwestern Montana. What a difference there is between the pale grayish head and neck of the nonbreeding Avocet to the apricot to cinnamon colored plumage that a breeding bird displays. 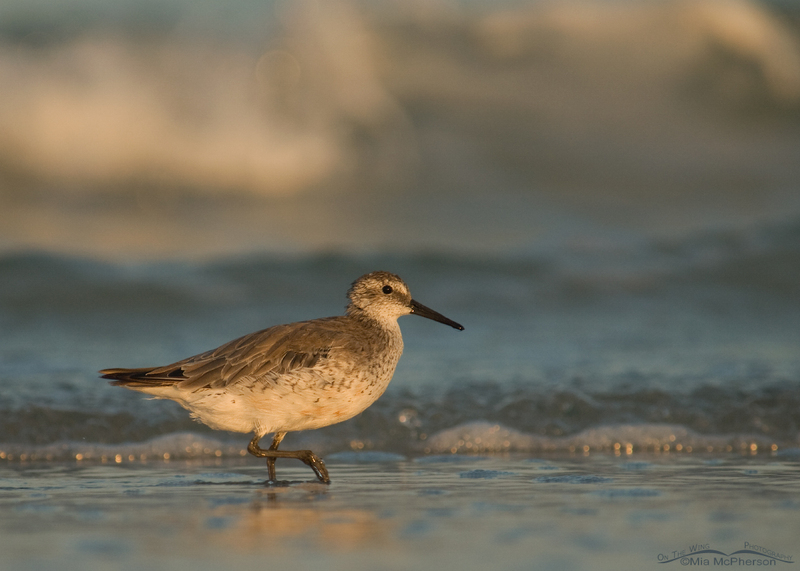 I photographed this Red Knot (Calidris canutus) in nonbreeding plumage in early morning light at Fort De Soto's north beach a few years ago in the month of September. 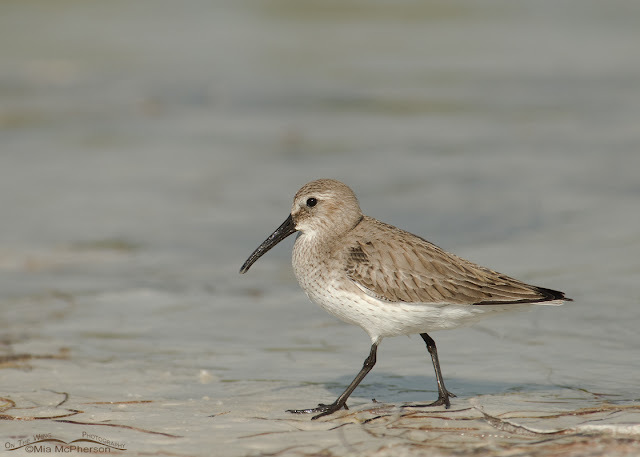 I've heard people call them "dull" little shorebirds. This Red Knot is almost in breeding plumage, the image was taken in May of 2008 as it foraged along the shore of the Gulf of Mexico in Florida. I very rarely saw Red Knots in full breeding colors there, but you can see the pale salmon color of the head, neck, chest and belly. I would not call a Sanderling (Calidris alba) in nonbreeding plumage dull but the soft grays and whites aren't very colorful. I took this image at Fort De Soto in the month of September a few years ago. I really liked the little droplet of water below the bill that I caught in mid air. 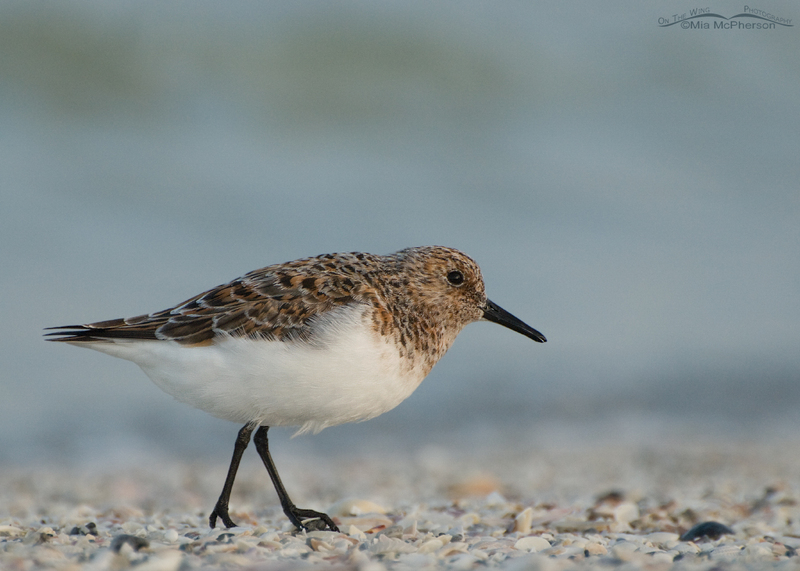 Sanderlings look very different in breeding plumage, they are far more colorful with rufous on the neck, upper chest, head and back. This bird was photographed in a sea fog on Fort De Soto's north beach during the month of May. It is amazing how much difference a few months can make in how these tiny dynamos appear. 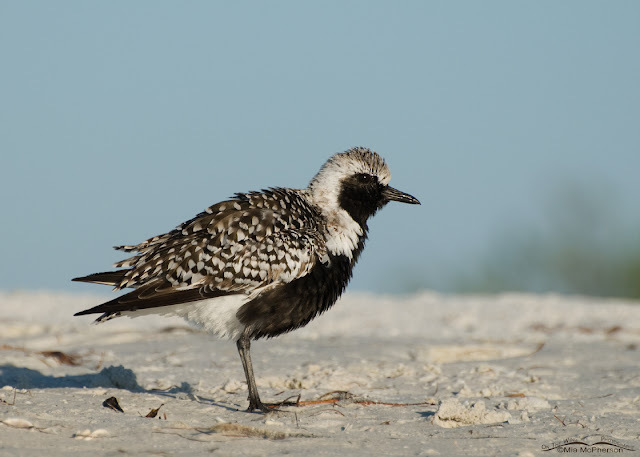 This is a photo of a Black-bellied Plover (Pluvialis squatarola) in nonbreeding plumage taken in Florida during the month of December of 2008, they are beautiful shorebirds and the largest plover of North America. This Black-bellied Plover was photographed during the month of May in 2009 at Fort De Soto's north beach, it is pretty close to being in full breeding plumage and probably soon after this image was created the plover would have made its way to the Arctic to nest. I find the plumage differences amazing in these shorebirds. Beautiful photos and fun to see the comparisons! While each has its own beauty, the breeding coloration is very tough to not just saw AHHHH over. Fort DeSoto has to be one of the best places to see them in the "coming and going" plumage and at times you actually get to see both there at once. Often you do think its two totally different species unless you have experienced both versions. Wonderful post and images Mia, I often don't get to see the breeding plumages, so nice to see them. 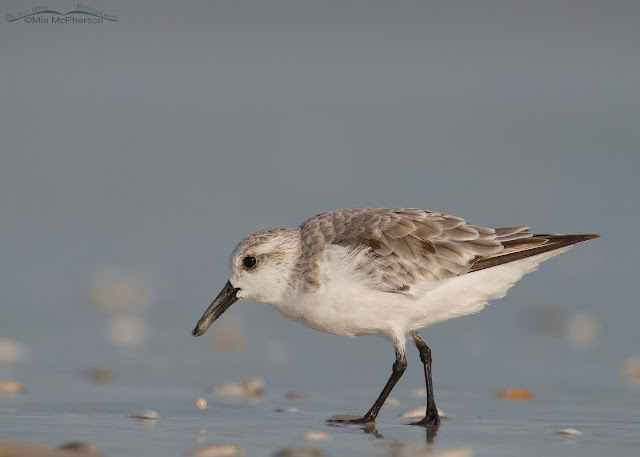 Great photo's of these shorebirds. Great images as always Mia! It's nice to see the comparison. That's great work Mia! Lovely photos and great documentation. A most interesting post filled with outstanding comparison photographs, Mia! I always vacation in Florida during the winter months, but had a brief visit this summer. I really enjoyed viewing all the shorebirds in their beautiful breeding plumage. Spectacular post, as always! Wonderful post and beautiful photos Mia. I'm very weak in shorebird ID, and I will go back to this many times to try to improve my skills. Thank you for a very helpful post! Great comparisons Mia! Beautiful photos! Wonderful set of pictures - the contrast in plumage is great. We dont get to see much breeding plumage down here! PS: This would be a great post to link to Wild Bird Wednesday on my site on Wednesday (!)! Wonderful images, Mia. Very instructive. Stunning photos and great interpretation, Mia! Thanks for another fantastic post! Love to see the differences side by side. All beautiful shots! I still have yet to see an avocet out in the wild. Thanks again for the wonderrful comments!